Having another clearout. This time it's several years' worth of illustration annuals that I just can't hold on to any more! These are the fat tomes of Contact, numbers 22-26, and two Le Books from 2009 I think. For the uninitiated, they're juicy collections of full-page illustrations in full colour, hard-bound, about 10" x 12" in size. 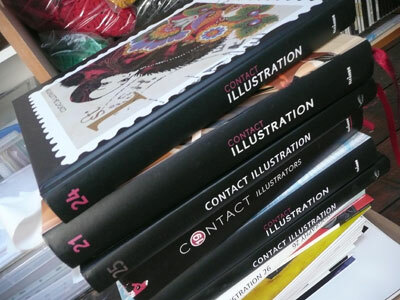 I also have an Art Book, which is the one that showcases only illustration agencies. Excellent reference books and free if anyone would like them, but I've got to ask donation of postage as they're HEAVY - a handful of quids should do it - which can be Paypal'd if you're keen. Or, you could collect. I'm guessing these are going to end up being donated to a college or university, but I thought I'd give the troops first dibs! I'll give it a week, then they'll be leaving the house, by hook or by crook. Oh I've got a shed to get rid of too. No really, I have. It's big too.